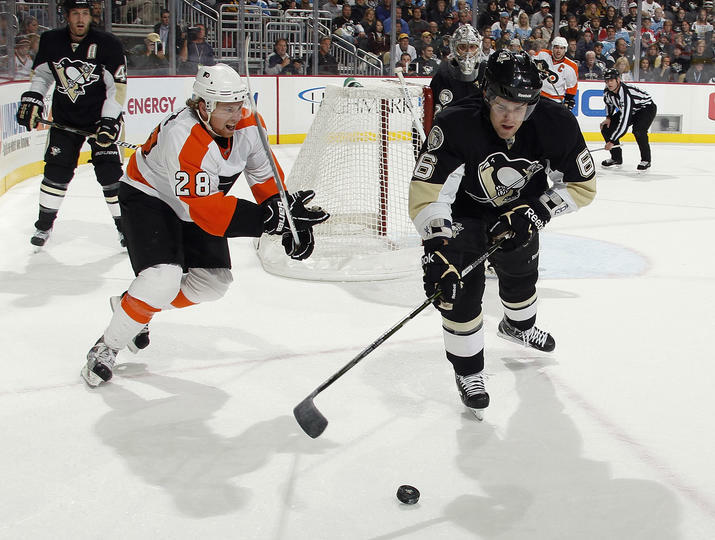 Pens lose, Malkin hurt, Engelland dominates. As far as the game itself, the Pens totally laid an egg. Aside from a brawling first 4 minutes and a "too little too late" energized final minute of the game, the Pens were essentially lifeless. They were backing off of the puck carrier, getting sloppy in finishing off their checks, and turned the puck over mulitple times. Claude Giroux made the Pens pay, capitalizing on one of those turnovers for a shorthanded goal and another golden opportunity on the power play. There were certainly plenty of powerplays to go around, and even more so in the 1st period. No, that's not a Halloween costume, that is actually his face. Then came an onslaught of minor penalties that packed the penalty boxes so much to the point where the Pens received a powerplay during 3 on 3 hockey. After all the dust cleared, it was 1-0. That's about all the good I can say about this one, however there is that elephant in the room that nobody wants to think about yet nobody can avoid. 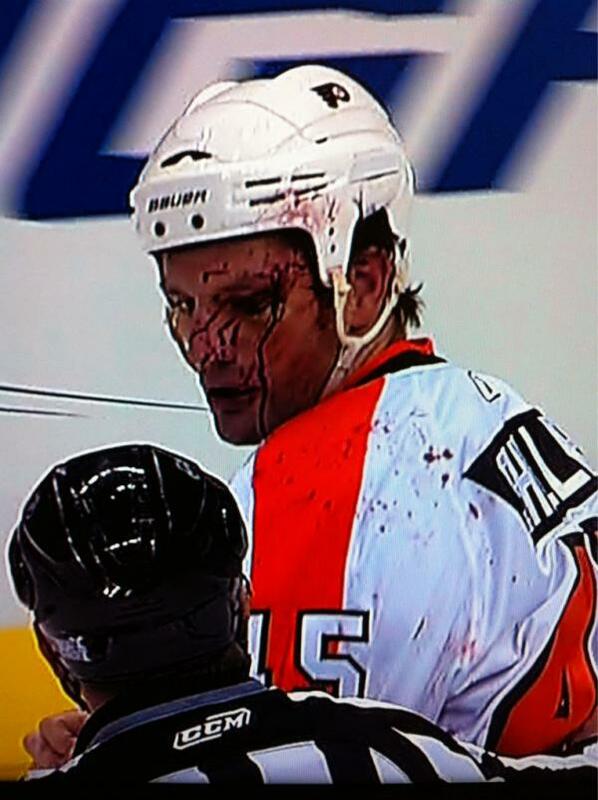 What happened to Geno? For those who did not pick up on it, Malkin stepped into the penalty box to serve the bench minor for "Too Many Men" and then was not seen again for the rest of the game. The only bit of information we have is that Dan Bylsma confirmed that it was injury related, yet did not specify the problem. Giroux's shorthander to tie the game up. It was a combined hiccup by Goligoski and Letang that Giroux just cashed in on. Offense- C Lost all of their edge in the 2nd and 3rd periods and would not find it again until about 45 seconds to go AKA "too little too late." Defense- B They were respectable. Fleury- B+ Can't blame it on him. He let one bad one in, but saved at least 4 more. I would say that it was his personal best game of the season. Powerplay- C- Awful, not to mention the shorthander on top of it. Penalty Kill- B- They did give up 1 goal, but held pretty strong afterwards. -Engelland is proving his worth in spades so far this year with both his fists and his stick. Another great fight and another decisive win. -If the Pens didn't have to go to Carolina tomorrow, I would suggest a bag skate. They deserve the pain after this performance. The key is not to let any of this carry over.